DripGuard™ ID Full Brim provides ID of short service employees, work groups, visitors, contractors, completed safety orientation, etc., with safety colors from yellow to blue. 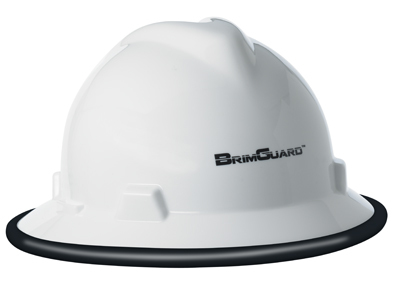 Durable and resuable, silicone BrimGuard™ ID is stretched over and fits around the hard hat brim without adhesives. Easy to remove to inspect the hard hat for damage and additionally protects the hard hat from damage. Highly visible at great distances and in inclement weather. Fits most popular styles of full brim hard hats. Total Weight is 2.9 oz. Additional discounts on orders of 12 items or more. Limited Lifetime Warranty and 30 day money back guarantee. Hard hat not included.